Easy mounting for your tour-pak! 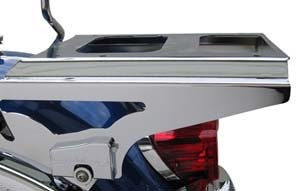 IN-156: Indian Motorcycle Chrome Quick Release Trunk Base for 2014-2017 Chieftain Models. 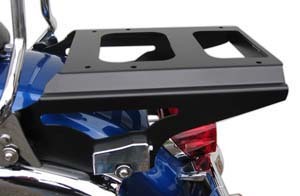 The Trunk Base is required for the Indian® Chieftain® Quick Release Trunk. It mounts directly onto trunk to allow for trunk installation on bike. 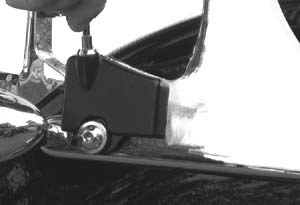 It features Quick Release technology so riders can quickly remove their trunk in seconds without tools. The trunk base is made from durable steel material with a chrome finish. Fitment: 2014 to current Indian Chieftain Models. Trunk sold separately. 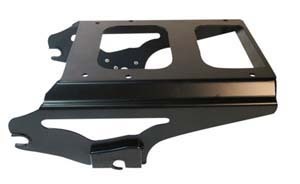 Base is required for the Indian® Chieftain® Quick Release Trunk. Mounts directly onto trunk to allow for trunk installation on bike. 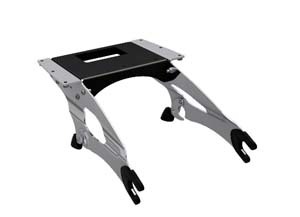 Trunk base is made from durable steel material with a chrome finish. 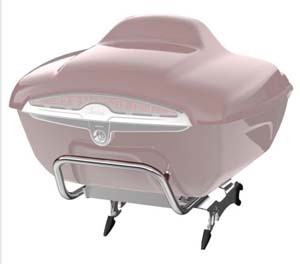 IN-297: The Trunk Base is required for Indian Motorcycle® Roadmaster® Classic Quick Release Genuine Leather Trunk and mounts directly to the trunk. 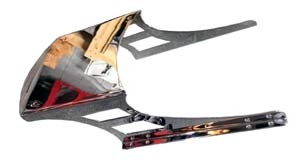 It features Quick Release technology so riders can quickly remove their trunk in seconds without tools. The trunk base is made from durable steel with a chrome finish. DB-60B: Allows you to mount most tour-paks to your Indian with style. Precision machine cut for perfect symmetrical lines. Mounting hardware included. Fits all Indian models except Scout. Made in USA. Black without slots. DB-64B: Similar to DB-60B but with slots. DB-64C: Similar to DB-60C but with slots. HMW-427-B: New and innovative Locking Push Button detachable tour-pak rack. 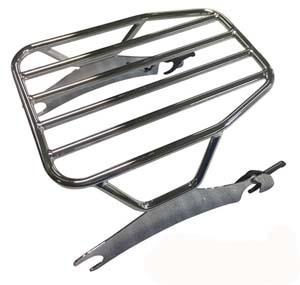 Go from your sissy bar to a detachable tour pack rack in seconds! This specially made tour-pak rack has the sleek style you're looking for. 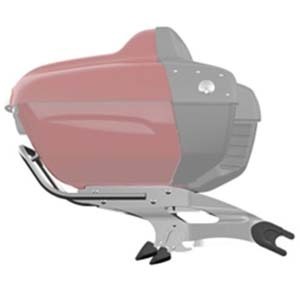 It uses the 4-point docking hardware (sold separately) to easily attach to your bike. With Patent Pending technology, a quick "Push of the Button" allows you to easily lock your rack; then with a turn of the key, you can quickly unlock and remove without the thumb curling, finger twisting, and knuckle chomping. It doesn't get any easier than that! 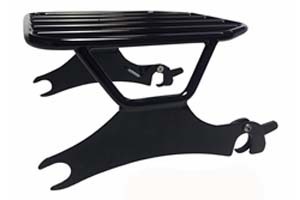 This tour pack rack is compatible with the Razor-Pak, Chopped, King or Leather tour pack luggage system. Lock it or lose it! 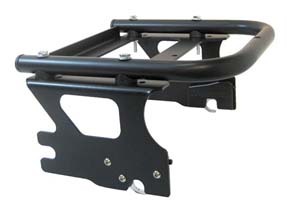 HMW-426-C: 2-UP detachable tour-pak rack for MY '09 to '13 touring models. 4-point docking hardware sold separately. Proprietary Push Button device for easy on and off operation. Go from your sissy bar to a detachble tour-pak rack in seconds. The specially made tour-pak rack has the sleep style you're looking for on those long tours. It uses the 4-point docking hardware (sold separately) to attach with ease. Compatible with Razor-pak, Chopped, King ro Leather Tour-pak luggage system. Show chrome finish. Special order part. HMW-426-B: Same as above in matte black powder coat. HMW-426-BC: Same as above in matte black powder coat w/chrome trim. HMW-424-B: Similar to HML-426-B, however, for model years '97 to '08 with appropriate docking hardware sold separately. 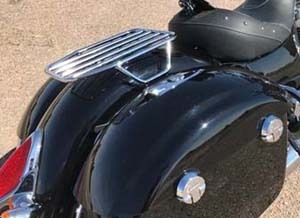 HWM-I30: The new, flat surface, detachable luggage rack for Chieftain, Roadmaster, & Springfield Models, mounts to the saddle bag spools with an easy to use spring loaded latch. 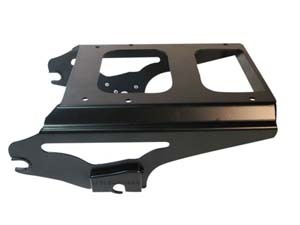 The carrying surface is 10 1/2" wide and 13" long and the rack is composed of ½" and 3/8" steel. 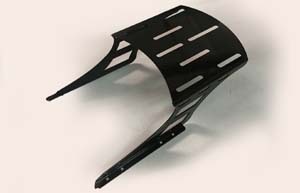 The rack sits low to the fender for a streamlined look that compliments the curve of the fender. Fits 2014 and later. Please note: the plastic sleeves on your Indian spools are required for the item to fit properly. HMW-I30B: Similar to above but in matte black. HMW-I30GB: Similar to above but in gloss black.